There is no better way to spend a weekend than taking a morning stroll through one of London’s beautiful public parks. Heading from Knightsbridge Underground, cutting across Rotten Row (the bridleway) into Hyde Park and towards the Serpentine lake, apt.Design spotted something wonderously striking floating on the water. Christo’s London Mastaba. Made up of 7,506 barrerls Christo’s London Mastaba is not a sight to be missed, literally you can’t miss it. Christo is most known from wrapping the Reichstag in a silver fabric back in 1995 and there are so many other projects that he has realised all over the world. All are as wonderous and awe-inspiring as the next, but a few to mention are The Floating Piers on Italy’s Lake Iseo, The Wall – Wrapped Roman Wall in Rome and Wrapped Trees in Riehen, Switzerland. As with every creator some projects do not end up being realised, such as Wrapped Monument to Cristobal Colon and The Museum of Modern Art Wrapped but the concepts remain as does the interest. 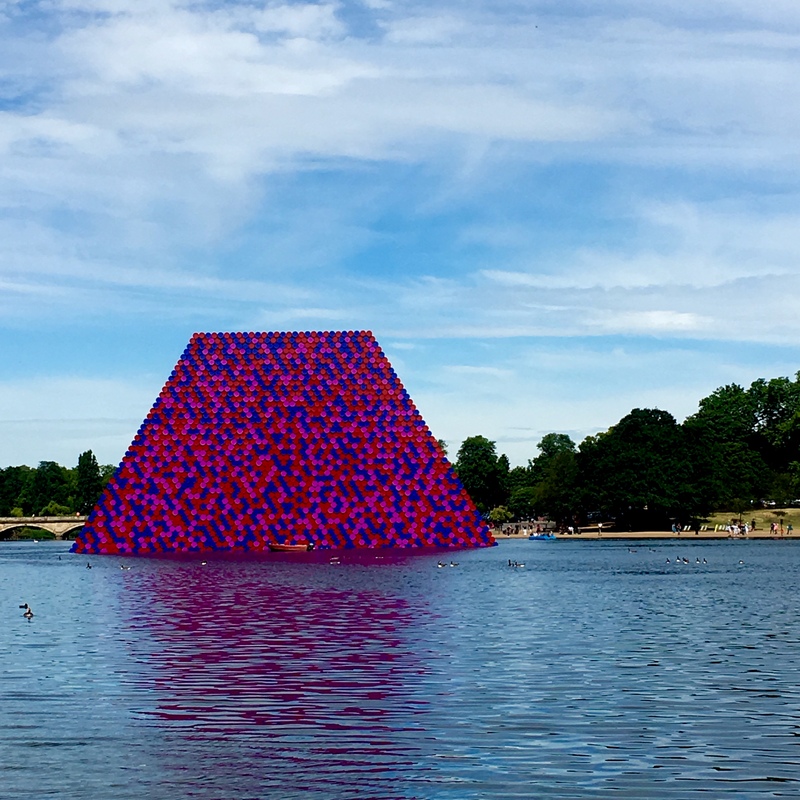 So apt.Design sat with a coffee and croissant next to the Serpentine Lido and gazed up at the London Mastaba, enjoying the sunshine, splashing and the sight of people in pedal boats reaching out to touch the collosal sculpture. Christo and Jeanne-Claude’s website is a fantastic resource to discover more of their projects.